The early 20th-century hanok mansion Baek In-je House overlooks Bukchon Hanok Village, high-rise office towers in Jongno and major landmarks of the capital city such as Namsan Tower. Some 75 years ago, the mansion’s first owner Han Sang-ryong (1880-1947), a banker and business magnate, described the view from his house in his memoir: “It’s like looking at the movement of black waves,” looking down long stretches of charcoal-black hanok roofs in the 1940s. Bukchon has traditionally been one of Korea’s wealthiest neighborhoods, a home for influential social figures for centuries. 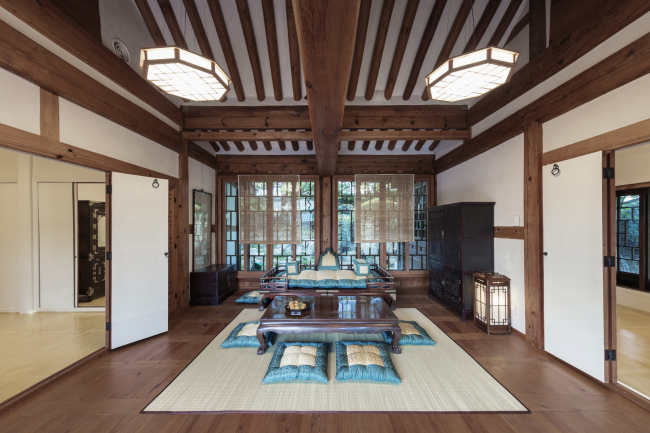 Of many residential hanok houses owned by leading figures in Korean society, the Baek In-je House represents the glamour and elegance of Korean’s upper-class lifestyle in the early modern days. 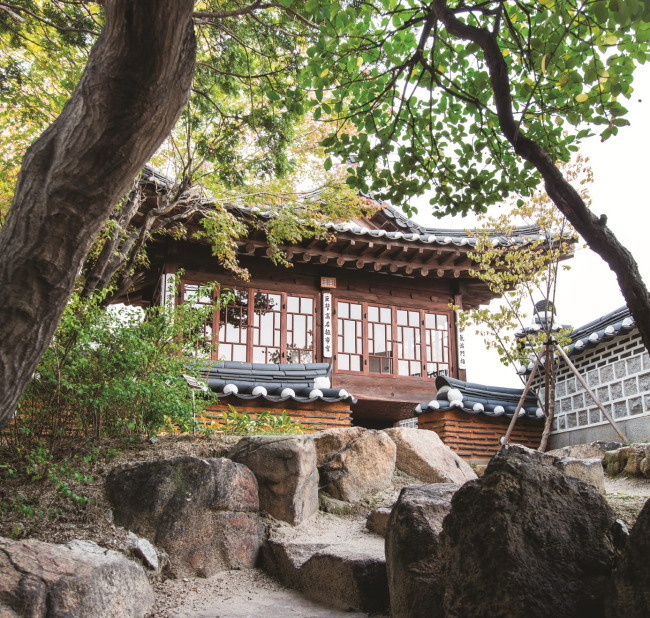 Built in 1913, the modern hanok had been the residence of three major figures – banker Han Sang-ryong, publisher-journalist Choi Seon-ik and surgeon Baek In-je. The house is named after its last owner, Baek In-je, the founder of Paik Hospital. The house drew attention recently when it was featured in the hit movie “Assassination.” The house appeared in the movie as a residence of Lee Gang-guk, a pro-Japanese business magnate, a figure that bears resemblance to the house’s original owner Han Sang-ryong, who was also a pro-Japanese business tycoon. The house, kept closed as private property for 100 years, opened to the public for the first time last month. The Seoul Metropolitan Government purchased the property from Baek’s wife, late Choi Gyeong-jin, the last resident of the house, in 2009 and turned it into a public museum. The house distinguishes itself from traditional Korean hanok housing in several ways. Dubbed “modern hanok,” it features a mix of traditional and modern housing elements. It consists of traditional Korean hanok housing units — men’s quarters Sarangchae, women’s quarters Anchae and detached quarters Byeoldangchae. However, the house also includes Japanese housing elements such as wood flooring using long planks, tatami mats, red-brick walls and glass windows. “These materials were very expensive and hard to get. Han was one of the few figures who could purchase them as he was an aristocrat and had connections with Japanese authorities and businesses,” said Choi Hye-ryeong, a guide at the Baek In-je House Musuem. One notable characteristic of the house is the expanded men’s quarters, where a male owner of the house receives guests and hosts social events. In this unit, many Japanese housing elements are found, such as the flooring, red bricks and tiles. “These elements reflect the early owner Han’s intention to utilize the mansion for political purposes,” said Choi. Numerous Japanese and foreign guests were invited to the house, including John Rockefeller, Jr. and Japanese governor-generals. The first owner, Han, lived in the house for 15 years until he was forced to hand over the ownership of the house to the bank he was running after he was accused of poor management. The house was purchased by Choi Seon-ik, a young heir from Gaeseong, in 1935. One of the first-generation journalists in Korea, Choi was a shareholder and journalist at Chosun Ilbo, a Korean-language daily newspaper, and served as the vice president of the JoongAng Ilbo. Choi brought major changes to the house during his nine-year residence. He raised the level of the front gate to the current position. The elevated front gate symbolized wealth and social status. In 1944, Choi suddenly returned to his hometown Gaeseong, selling the house to Baek In-je, an independence activist and renowned surgeon. Baek lived in his house with his family until he was abducted by North Korea during the Korean War. He was believed to have been purged by the North Korean regime. Baek’s wife Choi Gyeong-jin, who died in 2011 at age 103, lived in this house until she passed it on to their son a few years before she died. The Baek In-je House is open from 10 a.m. to 5 p.m. every day except Jan. 1 and Mondays. Admission is free. The guided tour runs four times a day. For reservations, visit yeyak.seoul.go.kr. To get to Baek In-je House, leave Exit No. 2 of Anguk Station, and walk 500 meters toward the Constitutional Court. The house is located across from Jaedong Elementary School.